Hi, it's Gaylynn here with a project for the Unity & Graciellie Design blog hop. Sentiment: You are capable of amazing things. This encouragement sentiment is perfect for graduation, good luck or just because. 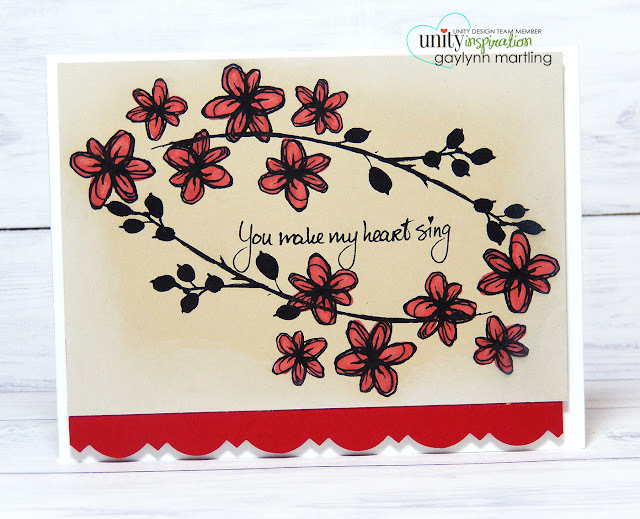 The sentiment is part of the new Graciellie Design stamp kit at Unity called Amazing Things. These new kits include her amazing art along with fabulous sentiments like this one. I also used the anchor for the September 2017 Layers of Life kit Love Anchors. This 9/2017 kit is the current LOL for September, but beginning in October, it will show up in the Past Layers of Life under the Love Anchors title in the Unity store. I needed a masculine graduation card, so I mixed these two kits. I used an ink smooshing technique for the anchor card using watercolor paper and distress ink pads in two colors, peacock feathers and pumice stone. There is no video for this anchor card, but the technique used is part of another project of mine with a quick tip video showing the way I use ink smooshing. 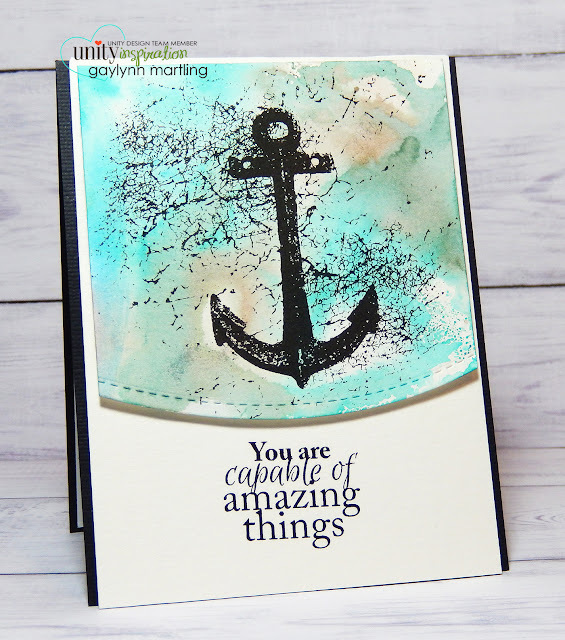 Supplies: Unity Stamp Co. Amazing Things by Graciellie Design and Love Anchors Layers of Life 9/2017; Lil' Inker Designs dies, Canson cold press watercolor paper, Ranger distress ink pads and jet black archival ink. We have TWO amazing Unity filled prize packages to give away. Leave a comment on EACH blog in the hop (including the Unity blog) for your chance to win. Holiday martini & video tutorial. Here is a festive holiday card featuring a martini glass. This card would be great for holiday invitations or as a unique Christmas greeting card. The martini glass was colored in Copic markers. I added popped up patterned paper and scalloped trim accents. Supplies: Unity Stamp Co. Bright Spirits by Angie Blom, BasicGrey paper, Copic markers and dies by My Creative Time, Lil' Inker Designs and Spellbinders. Hello, it's Gaylynn with two matching projects for the blog hop with CardMaker Magazine and Quietfire Design. I want to extend thanks to Suzanne Cannon with Quietfire Design store for sponsoring this wonderful hop. These beautiful red rubber cling stamps are designed and lettered by Suzanne. I get to make something pretty with her sentiment stamps. And so, for the handmade card and gift tag, I made a mixed media style base in watercolor and with wet embossing using a houndstooth stencil. Once dry, I blended two colors of distress ink onto the background. To soften the look, I added a heat embossed vellum sentiment panel. It was what I was going for, perfect for Christmas, yet in alternative colors. Here are the stamp sets that I used in my projects. Here is the hop lineup. Visit and comment on each of the blogs below. Quietfire Design / Suzanne Cannon will be hosting a giveaway of $50 gift certificate to their online store. Today, I am up on the CardMaker Magazine blog with stamp storage tips. This is a peek at how to better organize your stamps. Head over to the CardMaker blog for the details and more photos. 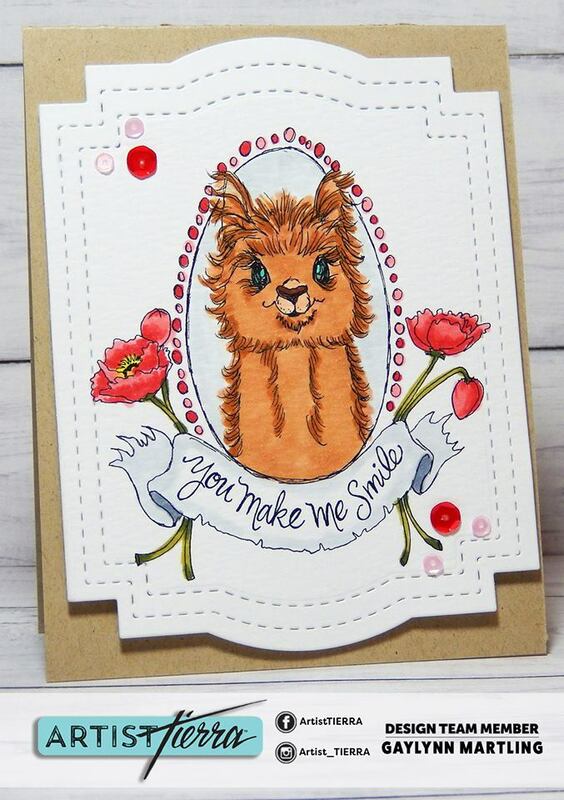 Today, I am sharing a cute framed llama all occasion handmade card. Sentiment: You make me smile. For this card, I used a scored kraft color card base and a die-cut image panel to feature the framed llama image. I think this card is great for most occasions or just because. Supplies: Artist Tierra You Make Me Smile digital stamp, Neenah cardstock, My Creative Time dies, Copic markers, foam tape, Sizzix Big Shot machine and Pretty Pink Posh sequins. Watercolor poppy flowers and tutorial. Today, I am sharing a watercolor card with poppy flowers, stems and buds. These pretty flower stamped images were brought to life with watercolor pencils. I like that it is perfectly imperfect. The sentiment was heat embossed onto a vellum panel. I incorporated two of the newest kits from Unity. The flowers pieces were all separate images. I decided to make a poppy plant with them. Here is a quick video tutorial for these poppies. Supplies: Unity Stamp Co. stamps from 9-2017 Kit of the Month Flowers, Foliage & Fall and Abundant Blessings by Lisa Arana, Ranger watercolor paper and gold embossing powder, vellum, Derwent Inktense watercolor pencils and brushes. Dreamy card edges and video tutorial. For the CardMaker and Spellbinders blog hop, scroll down or click here. A love themed floral card with dreamy accents. Sentiment: You make my heart sing. This was stamped with the newest Unity releases. I made a wreath frame from flowers and branches and then added the sentiment. To soften the look, I added a dreamy trim with white blending. This is great for a loved one, anniversary or Valentine's Day. 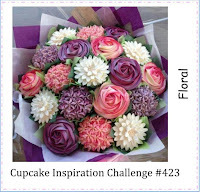 Here is a video tutorial for this floral card. 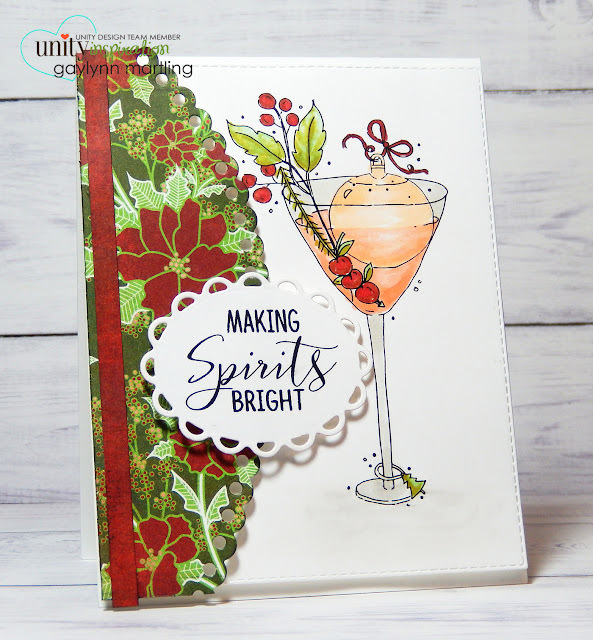 Supplies: Unity Stamp Co. stamps from Happy and Happy Holidays by Jolande and Marleen; Copic markers, Colorbox ink, ink blending tool, paper punch and cardstock. Mixed media style masculine birthday card. Because, I am forever in need of birthday cards, here is a mixed media style masculine card with a birthday twist. This was stamped with a holiday kit, but it can totally work for birthdays. I used the stars, added a birthday die-cut sentiment and mixed media watercolor to get this masculine look. Here is a quick video tutorial for ink smooshing on this masculine card. Supplies: Unity Stamp Co. 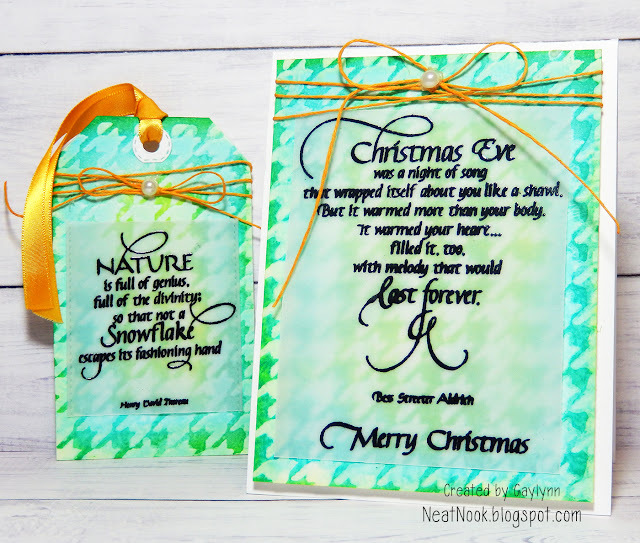 Happy Holidays by Jolande and Marleen, Ranger archival and distress ink pads, My Creative Time and Lil' Inker Designs dies. 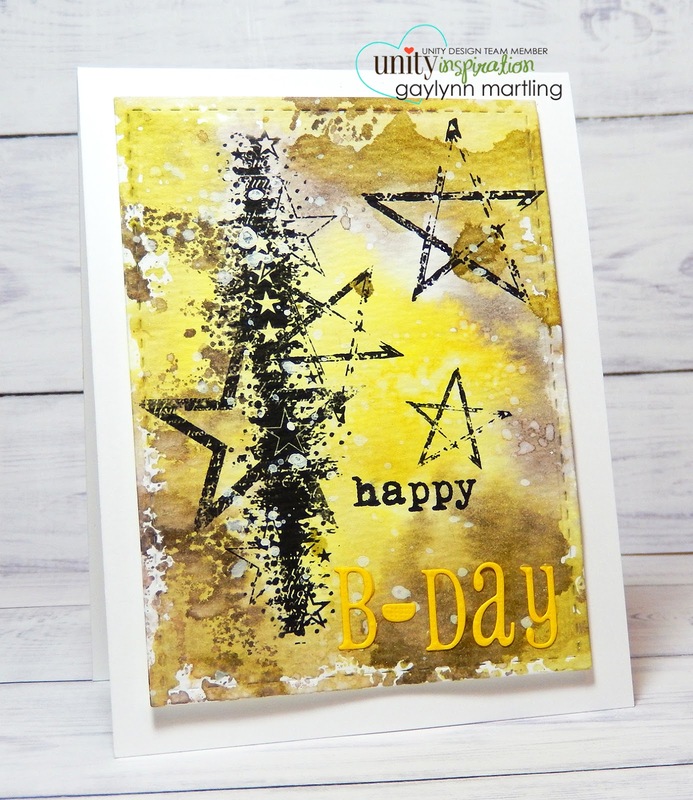 Simon Says Stamp Monday Challenge ~ It's written in the stars DESIGNER SPOTLIGHT WINNER! 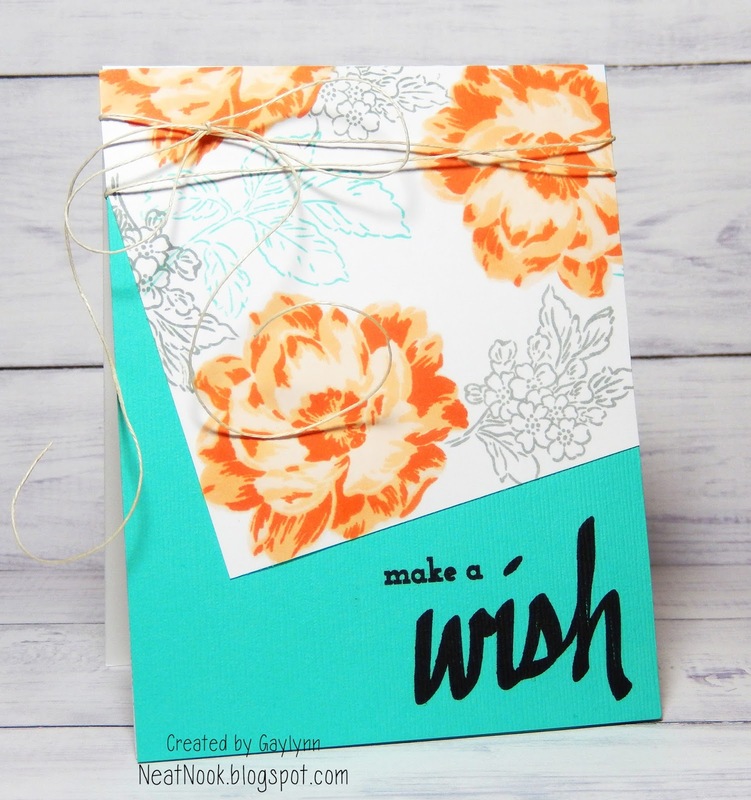 Today, I am up on the CardMaker Magazine blog with this quick and easy floral birthday card project and tutorial. There is a tutorial for this and more information about this card on the CardMaker blog. Hello, it's Gaylynn here with a project for the blog hop with CardMaker Magazine and Spellbinders. I am featuring the lovely Spellbinders Large Die of the Month for September 2017. For this design, I used patterned paper for the background. I wanted a soft look, so the intricate die-cut details are in white and in turquoise. I trimmed this beautiful die-cut to fit my A2 size card. The hop list is below. Visit and leave a comment on each of the blogs below for a wonderful prize chance sponsored by Spellbinders. The full list will be available on the CardMaker blog in case anyone gets lost. Spellbinders will be hosting a giveaway on the Spellbinders blog of a one-year kit subscription. Here is a closer look at my card. Supplies: Spellbinders Large Die of the Month September 2017, Unity Stamp Co. stamp from Sometimes I Wonder, BasicGrey Lucille paper, Bazzill and Neenah cardstock. Quick & easy Christmas tag card. If you want a quick and simple handmade Christmas card layout, this one is for you. With a piece of patterned paper, a background stamp and sentiment, you could have a card like this in minutes. It is easy to mass produce this for Christmas cards. And if you change out the theme, it would be great for any occasion. Here is a quick video tutorial for this card. Supplies: Unity Stamp Co. Merry Little Season by Angie Blom, kraft color paper, BasicGrey paper, hemp, ink and My Creative Time tag dies. Wishing that everyone in the path of the Irma storm will remain safe. Set of handmade Christmas gift tags. 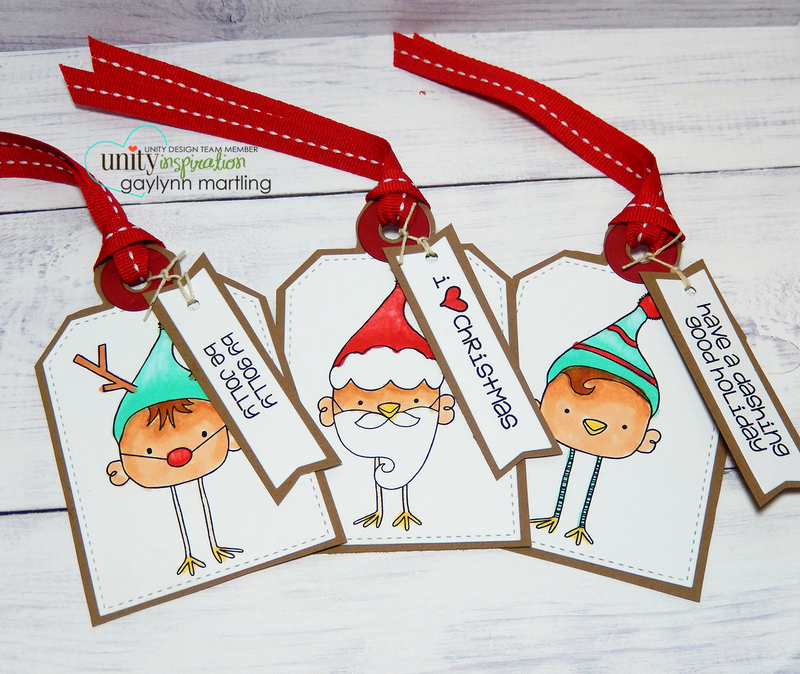 Here is a set of three cute little handmade Christmas gift tags. Have a dashing good holiday. They are little chicks all dressed for the holidays. This is a new release Unity red rubber stamp kit and it is so stinkin' adorable. I made a quick video tutorial for these gift tags. Supplies: Unity Stamp Co. By Golly Be Jolly, My Favorite Things die-namics, kraft paper, hemp, Copic markers and ribbon. I hope you enjoyed these. Thank you for visiting. 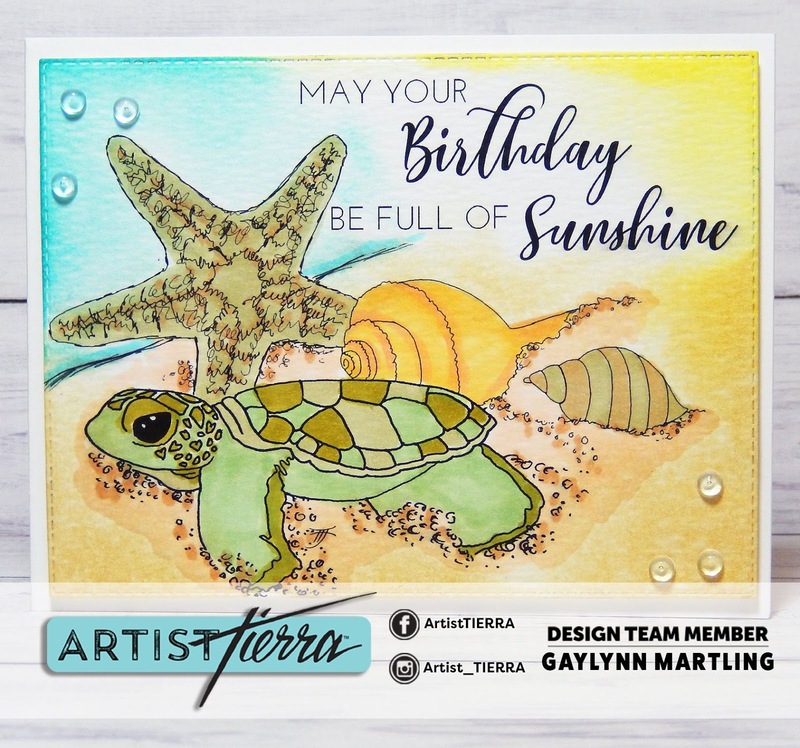 Sea turtle tropical birthday card. 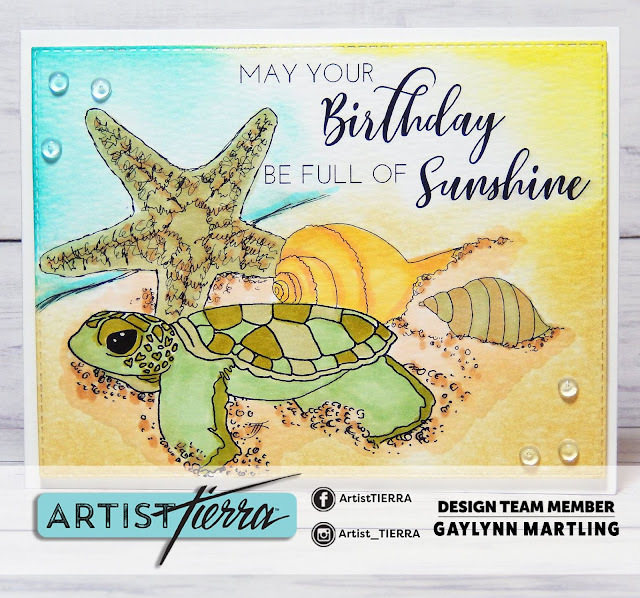 Today, I am sharing a tropical beach card featuring a baby sea turtle and seashells. Sentiment: May your birthday be full of sunshine. I adore this beach scene. Copic markers were used on the image and a blend of distress inks for the background. Supplies: ArtistTierra Sea Turtle and Shells, Copic markers, Ranger distress ink, Pretty Pink Posh droplets and My Creative Time dies. Wishing safety for those in the path of the Irma storm. Planner month page art with Copic markers. This monthly page was decorated with one of the free kits available at Unity this weekend only. Sentiment: Enjoy every little thing that comes your way. This girl and inspirational sentiment were colored in with Copic markers onto cardstock and then trimmed. The Copics will bleed through the planner page, so I like to add finished cardstock pieces. The roses are part of the planner itself. Unity is offering three of these planner gal kits free with qualifying purchase, this weekend only. Here is a quick video tutorial for this page. Supplies: Unity Stamp Co. Planner Gal: All Little Things by Angie Blom, Copic markers, Sizzix dies, Me & My Big Ideas The Happy Planner. Have a safe and fun Labor Day weekend. 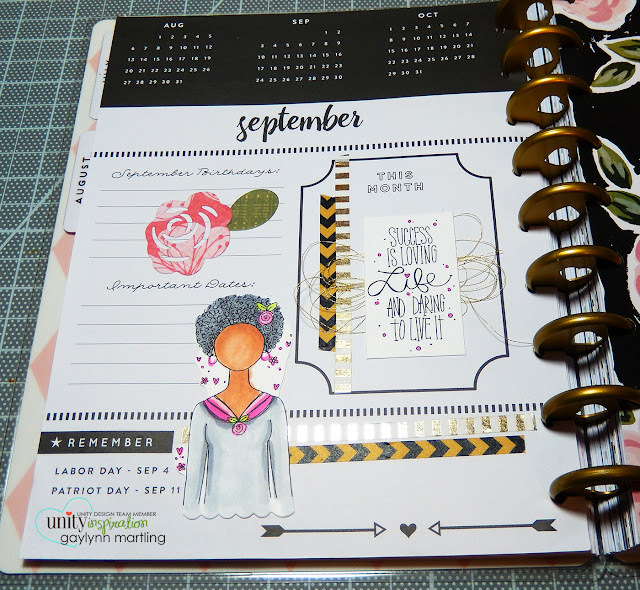 Here is a planner monthly tab with added accents and stamping. Sentiment: Be truthful, gentle & fearless. This background is part of the planner itself. I added doily accents with the planner gal and an inspirational sentiment. She is colored in with Copics and then trimmed. I made a quick video tutorial for this. This kit is part of the Unity promotion this weekend only, free with qualifying purchase. Supplies: Unity Stamp Co. Planner Gal: Be This by Angie Blom, Copic markers, doily, Me & My Big Ideas The Happy Planner. My new planner got a little decoration with the new Unity planner gals. Sentiment: Success is loving life and daring to live it. The Planner Gal line from Unity includes a girl and a sentiment. These fit nicely in planners, journals, bible journaling and on cards. 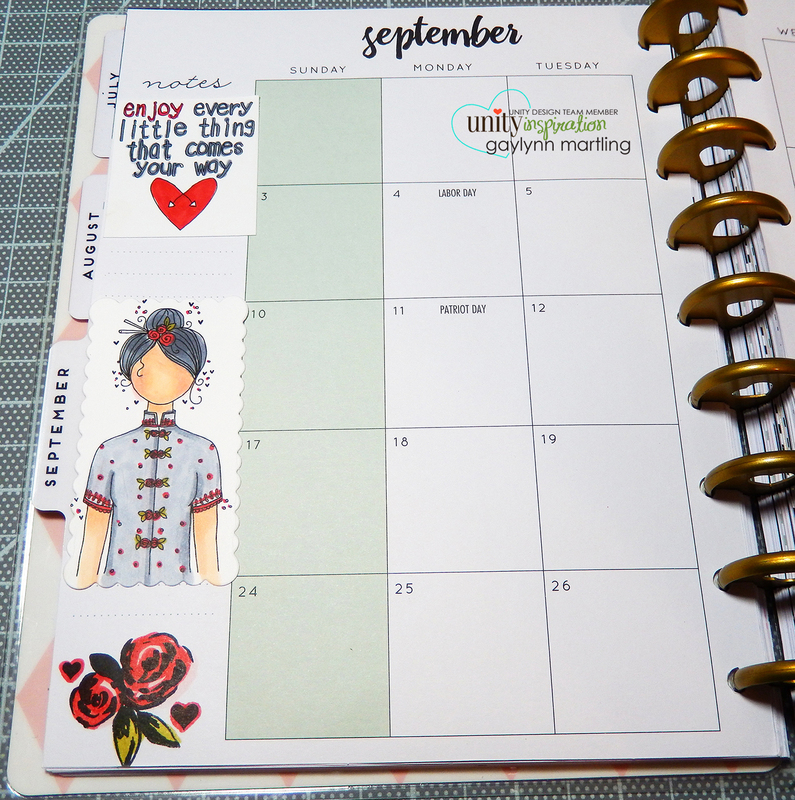 I dolled up September in my planner with this pretty girl. I made a quick video tutorial on the accents. Supplies: Unity Stamp Co. Planner Gal: Loving Life by Angie Blom; Me & My Big Ideas Happy Planner, Copic markers, gold thread, Sizzix dies and washi tape. 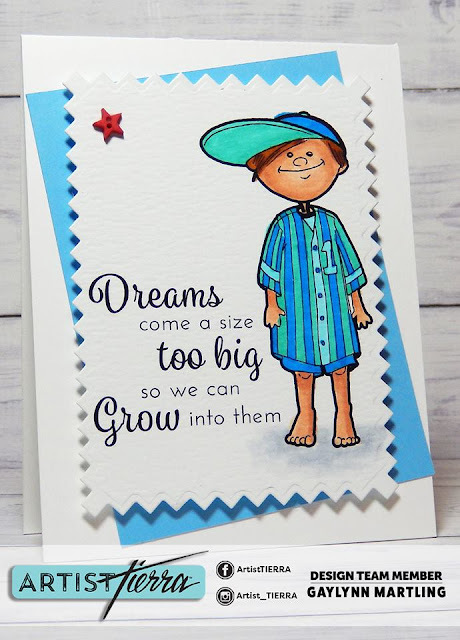 Grow into dreams baseball boy card. Here is a card made with the lovely art by ArtistTierra. Tierra asked me to be part of her design team to create pretty things promoting her Etsy shop. I am honored to do just that. I have created with her images through Unity Stamp Co. and now for her own shop as well. She is incredibly talented and super sweet. Sentiment: Dreams come a size too big so we can grow into them. This little guy reminds me of my son when he was little. I miss those baseball years. The sentiment is encouraging and so true. Supplies: Artist Tierra Baseball Boy & Glove, Copic markers, MFT die-namics and foam tape. Love my family, friends and all things crafty. Follow Gaylynn's board My Stationery on Pinterest. This blog features projects or articles made by me or guests and sometimes I include tutorials, opinions, challenges, giveaways or features of products that I like or have used. I sometimes include product links with affiliate marketing content and may accept forms of paid advertising, gifts or sponsorships from companies that I like. However, most of the expense and materials have been purchased by me as part of my hobby and interests. Copyright © 2019 Neat Nook Creations. All rights reserved. This blog content is for sharing my creations for personal inspiration and may not be used for publication or challenge submissions or contests by others. Content and images may not be sold by others. Reference to creative work here may be made but it is requested that links back to projects here be included.